LAHORE: (Saturday, November 24, 2018): Punjab University Institute of Agricultural Sciences (IAGS) has organized training workshop on ‘Tunnel Farming in Pakistan’. The aim of workshop was capacity building of our farming community, improve the production per acre and meet the market demands, supply of healthy vegetables around the year and application of modern practices to resolve the issues in tunnel farming. This workshop was for progressive farmers, entrepreneurs and those seeking to rise their per acre farm income. 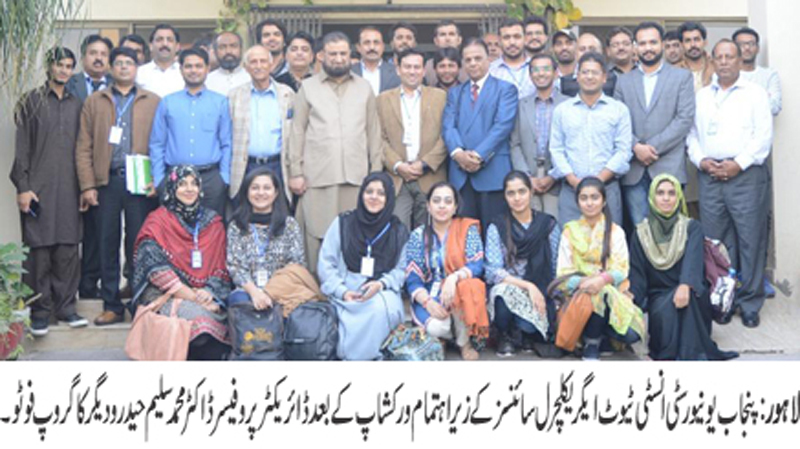 Director IAGS Prof Dr Muhammad Saleem Haider, CEO, Green Circle Sajid Iqbal Sandhu, Dr Nasir Subhani, Dr Tahir Shafeeq, Dr Mubeen Sarwar, faculty members and students were attended the workshop. In his address, Dr Muhammad Saleem Haider said that everyone knew agriculture was the back bone of economy so the growth of agriculture play effective role in the success of yields. “But the promotion of any business it was necessary to use best methods and techniques so the cultivation make good. It is very important thing to understand that how to get maximum yields from minimum resources. Before start of Tunnel farming it is necessary to get training from expertise of that field,” he said. He appreciated the efforts of Dr Mubeen Sarwar and his team for organizing the event. Sajid Iqbal Sandhu, Dr Nasir Subhani and Dr Tahir Shafeeq also threw light on the topic.